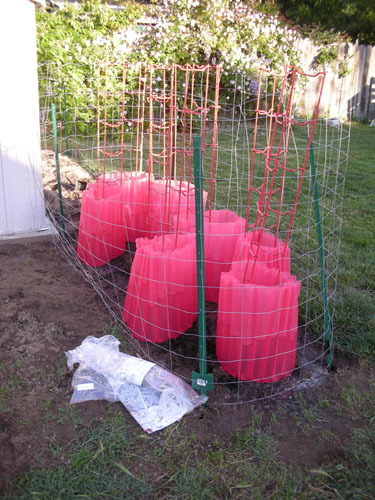 We ran errands in the morning, mostly driving to a bunch of hardware stores in search of t-posts for the latest anti-dog fence so I could plant my tomatoes out. The dogs don't stomp on tomatoes, but they do like to eat them fresh off the vine. We also bought a vacuum cleaner. See, we have this disagreement on vacuuming. Noel is allergic to the many pets, so he wants to vacuum all the time. I'm moderately allergic to the pets, but really really really allergic to dust, and our old vacuum cleaner kicks dust everywhere. So I hate vacuuming because it gives me asthma attacks (I prefer sweeping), and he hates not vacuuming because it gives him asthma attacks. So we spent $600 on a vacuum cleaner. Noel put it together when we got home and spent much of the afternoon vacuuming while I hid outside in case it didn't work as advertised. And I have to say... it did work. I came back in and while the dust was a bit stirred up by moving things around, it was nowhere near dangerous levels. Score one for the high-end vac. While I was hiding outside I built my tomato fence, laid out the plants, and planted them. The arrangement is simple: two sets of four plants arranged in squares 18" apart, with the tomato ladders towards the middle. Then Noel came out and we made an enormous muddy mess figuring out how to put the water rings around the plants (works better with one person than two, but ideal would have been some sort of flow control on the hose, too). And now I have a small tomato forest. We also mowed the lawn, washed plant pots, and picked up bits of trash that had blown into the garden. This was just one of those days when we had a lot to catch up on. You don't mention the brand, but it looks like a Dyson or one of it's ilk. I have read that the problem is in the emptying. Wear a mask and do it outdoors somewhere the dust that gets loose won't be a huge issue. Let us know how it works long term pls. It is a Dyson. I'm not sure about the emptying, because Noel did that, which was basically right into a trash bag (this model has a lever that just sort of dumps out the contents of the container through the bottom; don't know if that's standard). And presumably it's not bothering him all that much, either, because this morning he was talking about doing some more vacuuming. But yes, I will update on the vacuum when we've lived with it some more. If your Dyson did not come with a mini turbine head attachment, or if you haven't tried it yet, I highly recommend it for pet hair on furniture. Basically it's a little auxiliary vacuum head which attaches to the wand and has its own beater brush powered by the suction of the vacuum. In my opinion it's one of the ways the Dyson really earns its keep. 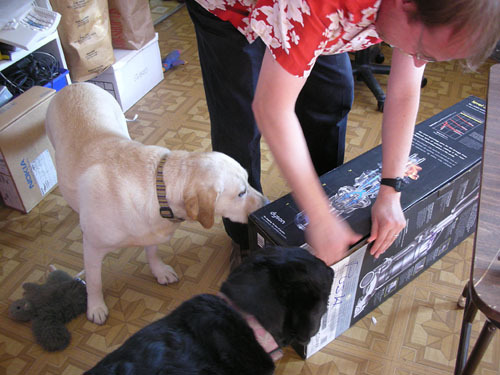 We sprang for a Dyson a couple years ago when the last crappy vacuum cleaner burnt out. I adore it, it works better than any vacuum cleaner I've ever used and I don't get sneezy from the dust that the old vacuum used to kick up. I swear it picks up the cat's weight in cat hair. I hope it works for you.